Gaudi J, born in 2015, bay, International Multi-Champion. He is by Emerald J (QR Marc x Emandoria (by Gazal Al Shaquab)) out of the famous mare Gomera J (Ekstern (by Monogramm) x Georgia (by Eukaliptus)). Gaudi J is a tribute to his breeders, Jadem Arabians of Belgium. Christine Jamar-Demeersseman and her husband Guy have owned Arabians since the year 1978. They both have had particular admiration for Polish Arabians since 30 years and acquired an important base of Polish breeding stock beginning in 1990 (or lease e. g. the stallion Ekstern). From this foundation a seemingly inexorable march towards success can be tracked. Gaudi J´s great great grandam Gwana was one of the early Polish foundation mares for Christine Jamar and her stud. She was bred by Christine to the Probat son Gil to give the very important and lovely grey mare Galia, in 1992. While standing at Michalow in 1996, the grand stallion Eukaliptus also serviced a visitor from Belgium, as Galia paid a visit to his court. As can happen, the breeding Gods decreed that a bay filly would be the result of breeding two greys to each other. This bay would grow up to be Georgia, a charming mare with fantastic eyes. Juggling a multitude of horses and breeding traits simultaneously, Christine was one of the first admirers of Ekstern. Christine did more than pay compliments. She ended up leasing Ekstern at the beginning of his career and showed him to his early victories in the ring as well. The grey Ekstern and the bay Georgia would play their prank of the unexpected, when they gave a chestnut daughter Gomera J in 2004. This was from Ekstern’s second leasing return to Jadem in 2003. This compact mare with her father’s flair, Gomera J, was in turn crossed to the Jamar-bred Emerald J to yield a stunning son, our subject Gaudi J, a fantastic merging of his illustrious ancestors. Emerald J’s pedigree is replete with stars as well. He is of the heart pounding “E” family of Michalow. In this case through his Triple Crown winning dam, the exquisite Emandoria. 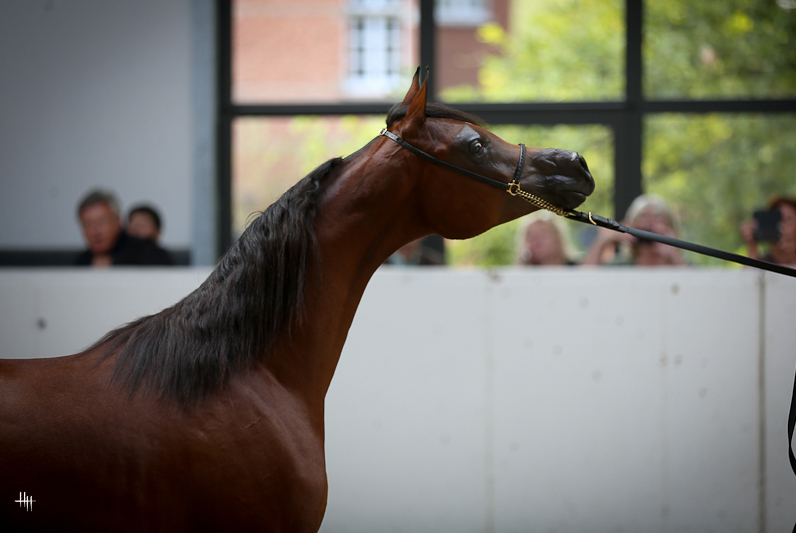 Emandoria is by Gazal Al Shaqab, of course, and this means that Emerald J is double Gazal since his grandfather is the Gazal son, Marwan Al Shaqab. These multiple crosses to Gazal Al Shaqab and Eukaliptus, who is also the great-grandsire of Emandoria, go a long way towards explaining the general excellence of Gaaudi J. With such a pedigree, Emerald J, foaled in 2010, could not fail to succeed. “Emerald was my dream stallion to breed,” Christine tells me with a smile. “I love QR Marc and I was involved in managing him when he first came to Europe. And then we have Emandoria – what a mare! She is so beautiful and captivating. When the opportunity came along to breed to her, I jumped at the chance. Of course, I hoped for a filly and Guy, my husband and best friend, told me not to be disappointed if we had a colt. And of course – we had a colt, but what a colt…! I could not be upset for long once I saw Emerald’s quality and he has more than fulfilled my expectations.” Emerald J was sold to Al Muawd Stud, Saudi Arabia and returned in 2017 to Jadem Arabians continuing his breeding careed at Jadem Arabians with Christine Jamar. Gaudi J is also a full brother to Gallardo J (bred by Christine Jamar, Jadem Arabians/Belgium and nowadays owned by Ajman Stud).